There are around 200,000 glaciers worldwide. They play a central role in the water cycle, particularly in the middle and low latitudes, by offsetting runoff fluctuations. Rivers are lifelines on which billions of people depend worldwide, either directly or indirectly. Will water become scarce in the near or distant future if glaciers become increasingly smaller or disappear completely? Will the Alps, the Himalayas, the Rocky Mountains and the Andes continue to act as water towers? We set out to answer this question in a study of all the earth's mountain regions and the drainage basins of their large rivers. We used a glacier model that describes the development of glaciers worldwide and their future runoff until the end of the 21st century. First, the good news: ice-covered mountains will continue to provide enough water throughout the year in future. In an initial phase, climate change will actually cause the runoff to increase, as water stored as ice is released. However, if the glacier becomes too small, it will reach a tipping point, which we call "peak water". The key point: in order to properly plan the distribution of water in future, for example for agricultural irrigation or hydropower, we have to know whether we are before or after "peak water". In the Alps, the tipping point is now. In most of the drainage basins in South America, the glaciers are already providing less water. However, in Asia and North America, the total runoff from glaciers will continue to increase until around the middle of the century, and will only then begin its downward trend. Will people in the lowlands notice the difference? Glaciers stabilise river levels in summer via high volumes of melted ice. 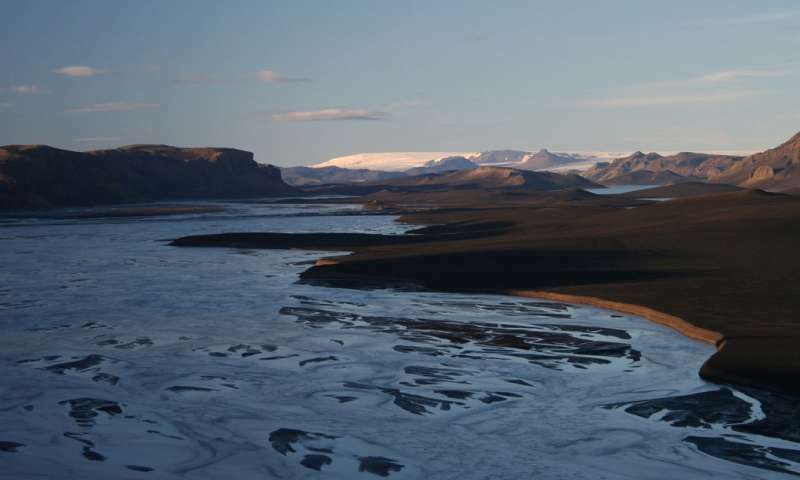 Our calculations show that by 2100, significantly more than half of the glacial ice outside the polar regions may disappear, and the consequences could be dramatic: where a roaring glacial stream once flowed during the warm months, only a dry, stony desert will remain. By the end of the century, almost all glaciers worldwide will provide significantly less water in the summer months than they do today – some volumes will be reduced by more than two thirds. But will these changes be noticeable in the densely populated downstream areas of large rivers? Particularly in central Asia, for example in the inflows to the Aral Sea or the Indus, these dry summers will mean accepting a heavy reduction in the availability of water – despite the fact that glaciers currently only cover relatively small proportions of the drainage basin. The same is true of some rivers in the Andes, and – to a lesser extent – in the Alps. The situation could become precarious in future due to the increasing frequency of heatwaves. However, ice melt is only important near to the glaciers. For around two thirds of the world's large rivers, the situation is not alarming. The glaciers are too small for their disappearance to significantly affect continental runoff. Our study highlights the "hot spots" where retreating glaciers will cause water shortages in future. Many problems could be solved by more efficient use and better distribution of water on the level of the affected communities. In developing countries, this requires significant investment and a transfer of expertise. Climate change is a global problem with local consequences. If the international community succeeds in restricting the temperature rise to an acceptable level via contributions from each individual member, the effects may be mitigated. Many glaciers would still shrink significantly even with major climate protection efforts, but the consequences for water resources would be more moderate.